Rust, Marsala and Terracotta are this year’s color pantone for fall. It is such a pretty color to wear because, it is bold yet soft at the same time, and very retro inspired. Doesn’t this color just reminds you of the leaves changing color, pumpkins or even pumpkin spice latte? 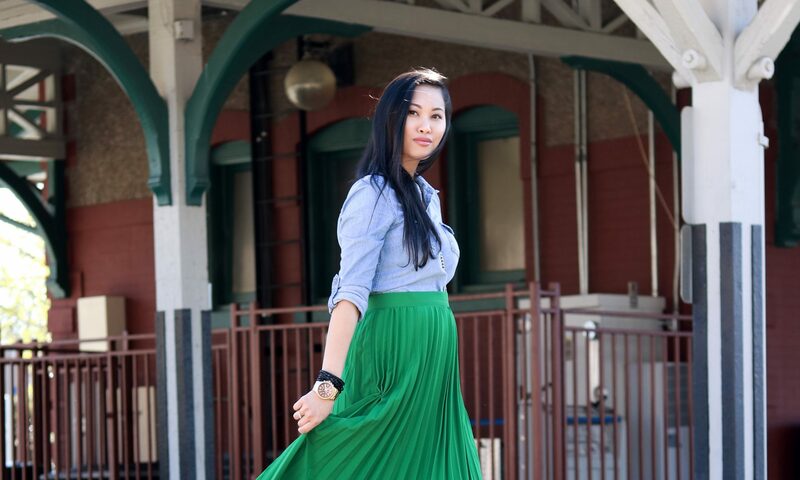 For this look, I paired this pretty A-line midi skirt with basic colors like white and black. Since the color of the skirt is the star of the show, I want to keep the rest of the outfit simple, and on the neutral side. I am obsessed with this heels! It is so comfy and I love how it gave an edge to this feminine look. I also paired this outfit with a denim jacket for when the weather gets chilly at night, or you could paired it with a leather jacket and you will still look chic. Thank you! ☺ Me too! I love how versatile it is cos you cld wear it with heels for a more girly look or sneakers for a more casual day.